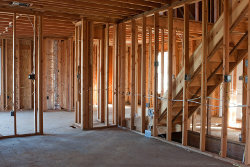 Building a new home from the ground up can be a very rewarding experience, but there are many decisions to make along the way. Every aspect of construction needs to be planned and thought through. There needs to be a budget, but that does not mean it’s OK to cut corners. The construction of your new home is not an area where you want to risk using a subpar contractor or buddy for your home electricity needs. The safety of you and your family should be put before cost, which is why choosing Budget Electric for your new home construction needs is a good choice. We have over 30 years experience in the Dubuque area of eastern Iowa as well as northwest Illinois. We are experienced, professional and affordable. If you are building your dream home or making remodeling improvements to an existing one, there are a lot of things to consider. Making sure your house or remodeled home is safe and up to code is one of them. This is a job that is best left to the training and experience of professional electricians like those at Budget Electric. We offer free estimates and consultations and can work within your budget. 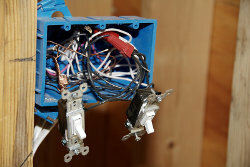 We can advise you on everything pertaining to the electrical needs of your new construction or remodeling wiring. This includes surge protection, custom home wiring, electrical plan layout and design, home automation systems and generator installation. Everything you need for a new construction home or a house rehab project, we can provide with quick, courteous service that stays within your budget. If you are building a new addition to your home, adding an outdoor patio area or constructing a new porch, we can help with all your lighting and outdoor electrical needs. Whether you need security and landscape lighting or lighting for pools and garages, we can help. 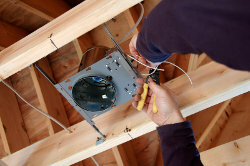 Additionally we offer install new outlets, dimmer switches, ceiling fans and recessed or track lighting. In addition to electric panel installation and upgrades, every home needs reliable smoke alarm and CO2 detection systems. Newly remodeled kitchens may need lighting under the cabinets or the installation of new appliances. Bathrooms may require wiring for hot tubs. You can put your trust in Budget Electric, with over three decades experience in new home construction and remodeling and wiring in Dubuque, IA. By hiring Budget Electric to wire your new home, you will get a top quality job that will ensure that you and your family will be safe from fires that could be caused by shoddy workmanship. Don’t pay a higher price for the same quality service you’ll get with Budget Electric. We serve the eastern Iowa area around Dubuque, as well as Galena in northwest Illinois. Stay safe and stay within your budget. If you are building a new home or remodeling an existing one in Dubuque, Iowa or surrounding areas in northeast Illinois including Galena, call the Master Electricians at 563-590-5679. We are Licensed and insured and will provide free estimates and consultations. No job is too big or too small. We offer flexible hours and emergency service. We accept credit cards, personal checks and cash. Call today.